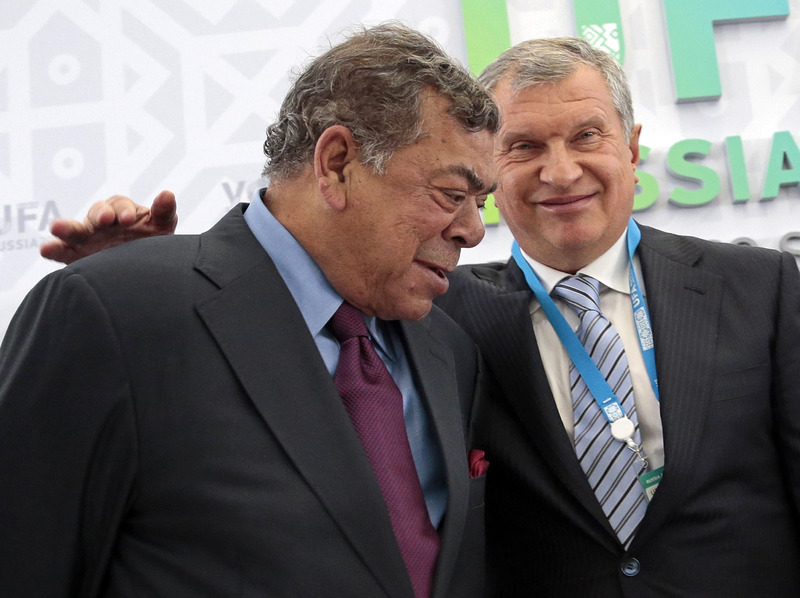 Shashi Ruia of India, chairman and co-founder of Essar Group, left, and Igor Sechin Rosneft CEO. While some procedural delays held up the Rosneft-Essar deal, the Saudi oil major Aramco suddenly began talks with the Ruias of Essar. According to Reuters news agency, the Russian President stepped in to save the 13 billion dollar deal with Rosneft. The 13 billion dollar mega-deal involving the purchase of India’s Essar Oil Refinery by Rosneft and a consortium comprising the Trafigura Trading Company and United Capital Partners (UCP) of Ilya Shcherbovich almost fell through, because of attempts by the Saudi state oil major Aramco to grab this asset, the Reuters news agency reported. Aramco started negotiations with brothers Ravi and Shashi Ruia, the owners of Essar Oil, around two months ago. The news agency’s sources differ over what saved the deal for Rosneft: some claimed that Rosneft had offered more money than the Saudis, while other sources said the outcome was influenced by the direct political intervention of President Vladimir Putin and Prime Minister Narendra Modi, both of whom wanted the deal to go through. The final agreed sum of $13 billion is twice the amount which Rosneft originally estimated Essar to be worth, said the news agency sources. The original estimate was $5.7 billion. Igor Sechin, Executive Director of Rosneft, first held talks with the Ruia brothers in 2014. Exclusive negotiations began in July 2015, when the two sides signed a preliminary agreement. Reuters learned about the intervention by Aramco in September 2016, from a total of seven Russian, Indian and Saudi sources in the oil business, who participated in the negotiations, or were familiar with the details. That the Essar Group was considering the Saudi Aramco as a potential buyer of a stake in the company was first reported by the Bloomberg Agency, citing sources, in February 2016. The agency reported that preliminary discussions between Essar and Aramco were held in January 2016, at the World Economic Forum in Davos. Sechin learned about the Saudi interest in the beginning of September, when he came to India for the next round of talks, travelling in from Hangzhou, where he was a member of President Putin’s delegation for the G-20 Summit. Sources said Sechin began negotiations with the Ruia brothers the day he arrived in India. He was told that talks had been dragging on for far too long, and the exclusivity period had expired in July, so Essar had begun discussing a possible deal with other possible partners, including Aramco. According to sources, Sechin held out a warning to the Ruias that if they refused to finalise the deal, they could lose supplies of Russian oil and financial aid from Russia. The meeting ended abruptly. The Essar management had even prepared a draft statement saying the deal with Rosneft would not take place, sources said. Both Rosneft and Essar, however, declined to comment on details of the meeting. Meanwhile sources in Saudi Arabia confirmed that Aramco was seriously considering buying the Essar oil refinery and were willing to pay up to $9 billion for the Indian refinery, or a significant share in it. Aramco, however, declined to comment on any offer to the Ruias. The deal with Rosneft was, however, too important to be broken, notes Reuters. For India, this would have hampered Modi’s goals of addressing the issue of bad debts. For Russia, the deal marked an important milestone toward building a global oil empire, despite Western sanctions. To ensure the deal went through, Rosneft quickly created a consortium, and a deal was struck for them to buy 98% of the refinery, as well as the terminal, for $13 billion. Sources noted that without the political intervention of Moscow and New Delhi, this transaction would not have been possible. “Putin and Modi saved the deal,” a source said. The Indian Prime Minister’s Office declined to comment on this issue. Putin’s spokesman Dmitry Peskov said that “naturally”, the Kremlin defends the interests of Russian companies and lobbies for them, particularly when it comes to large transactions. However, in the Essar case, he said, no orders came from the Kremlin. This was entirely a corporate decision taken by Rosneft, he added. Essar released a statement saying it was in talks with several potential buyers, but eventually settled on Rosneft, which had made the most attractive offer. The company denied that any representatives of Putin or Modi intervened in the deal, which was mentioned by both leaders at the end of their bilateral summit in Goa on October 15.